No one ever expects their kayak to tip over and then not be able to get back in; but it happens. And when it does rather than having to swim back to shore, be prepared with the the Seattle Sports Dual Chamber PVC Free Paddle Float. 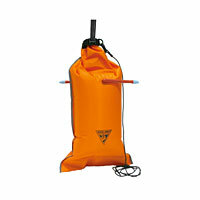 This essential self-rescue device for kayakers, features oversized dual air chambers for mazimum buoyancy and comes equipped with a safety tether and quick clip to secure to your paddle shaft. Constructed of PVC-free materials. The Paddle Float…don't leave shore without it.